Manley Forrest Winkley has been a long time away from home. He walked out the front door of Number 40, North Berwick Avenue, Indianapolis on December 12, 1942. His country had been at war for a year; he had heard the stories of the Marine Corps defending Wake Island to the last man, felt the bitterness of the surrender of Corregidor, thrilled to newsreels of Marine flyers hurling themselves at the Japanese fleet at Midway, and followed the halting progress of the battle for Guadalcanal. The Marines were the spearhead at the short end of the stick in 1942, and it took a certain kind of man to volunteer for certain hardship and possible death. Manley knew what to expect when he walked out the door. He left behind his mother Nadia, his siblings Lyman, David, Duane, Cora, and Blanch, and everything he had known and loved in all of his nineteen years. Perhaps the hardest goodbye was to Lyman Winkley. Although technically uncle and nephew, only three years separated Manley and Lyman; they were best friends and comrades, attached at the hip, doing everything together. The war severed this bond that December. Manley left for South Carolina; Lyman returned to his high school studies. Manley was put through the wringer at Parris Island, and emerged as a Marine private handy with a rifle; the first decoration he pinned to his forest green uniform was the Maltese cross of a sharpshooter. The Corps wanted him to serve with the artillery and sent him to Camp Pendleton, California; Manley went to the Headquarters and Service Battery of the camp’s “cannon cocker” training battalion, where he earned the stripe of a Private First Class April 1, 1943. Artillery training didn’t take with Manley, and on July 7, 1943 he was transferred to the 23rd Replacement Battalion. Soon he was crossing the Pacific on the SS President Polk, bound for a land he’d only vaguely noticed on world maps – New Zealand, home of the Second Marine Division. For the next several weeks, the 19-year-old Marine lived a fascinating double life. 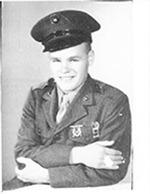 During the week, he was PFC Winkley 504632, rifleman of Company B, First Battalion, 2nd Marines, and subject to the orders of every man from the rank of corporal to colonel. On his few liberty days, he was just teenaged Manley, exploring a foreign land, making new friends, and doubtless enjoying every minute. It was no secret that the 2nd Marines were bound for combat in the near future; as he celebrated his twentieth birthday on September 17, 1943, Manley might have wondered what the next two decades would bring. Company B boarded the USS Harry Lee on October 17, 1943. They spent a week participating in training maneuvers which ranged from the irritation of being soaked in an assault craft to the muted rumors of fellow Marines falling from nets or getting caught in swamped landing craft; such incidents were almost always fatal. In early November, the blacked-out transports set sail for an unknown destination. Within days, Manley Winkley was told where he was bound – the island of Betio, in the Tarawa atoll. The names meant nothing to him; rare was the Marine who had heard of the Gilbert Islands before the war. Operations officers told the men that the tiny atoll would be a tough nut to crack, but they could count on naval bombardment to eliminate most of the enemy. Some went so far as to promise that Betio would be wiped clean off the map; the Marines were only needed to walk ashore and plant the flag. Some of the men of Manley’s battalion were disappointed at being placed in regimental reserve, while others secretly thanked a higher power for the assignment. Manley heard the echoing blast and rumble of naval gunfire through the morning of November 20, 1943. From his place on the deck of the Harry Lee, Betio appeared as a dark, smoke-covered smudge on the horzion. Perhaps the officers had been right, and the island would be a pushover. With some jealousy, Company B watched their comrades in the regiment’s Second and Third battalions head for the beach. Soon, Manley was climbing down a cargo net and stepping into a flat-bottomed landing craft; he spent the next several hours bobbing up and down in the surf, stealing glances over the bulwarks at the smoldering island – the sounds of gunfire couldn’t be ignored. Apparently, the landing was not as easy as believed. Suddenly, a tracked landing vehicle pulled up alongside. Screaming officers chased Manley over the side of his boat and into the LVT, which clanked, shuddered, and began heading towards the beach. The Marines inside tipped backwards, jolted, fell forwards as the vehicle’s treads ground over the coral reef surrounding Betio – and as they crossed the last few hundred yards at a snail’s pace, feeling the impact of Japanese artillery, hearing machine gun bullets rattle off the side of their LVT, finally realized just what awaited them on the beach. The last words many would hear was the order to evacuate the vehicle and find cover. What happened to Manley Winkley will probably never be known for sure. He may have been shot as he climbed over the side of the landing craft. He may have been hit by a shell the moment he hit the beach. He may have managed to find some cover and fight back before a projectile, Japanese or American ended his life. The details don’t matter; the result is the same. Manley Winkley lost his life just after landing on Betio, November 20, 1943. He was barely twenty years old; he was in combat for less than twelve hours. When the island was finally secured three days later, the task of burying the dead began. The Marines had never seen casualties on this scale before. Dead Americans littered the beaches, floated in the water, had to be pulled from craters and dugouts and foxholes. Not all could be identified, but those that could were buried with their names. All were marked with simple white crosses. Manley Winkley died with no identity. He was buried as an unknown. His body lay in its informal grave for seventy years. Back in Indianapolis, the Winkley family was consumed with grief over the death of Manley. They had lost a son, a brother, a cousin, and a friend – but Lyman Winkley had lost his idol. 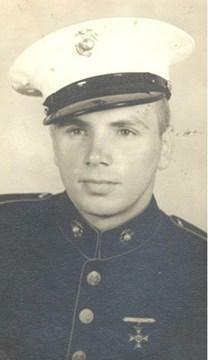 He lied about his age to enlist at the age of sixteen, “to take his uncle’s place” with Company I, Third Battalion, 21st Marines. Lyman would serve through the Korean War, where as a member of the “Chosin Few” he was wounded twice, but survived to be discharged and raise a family of eight. Lyman passed away in 1998. On June 1, 2013, a set of skeletal remains was recovered from Betio. Experts took DNA samples. Researchers scoured records. Hopeful family members were contacted, samples taken, and reams of data collected. After almost seventy years, the remains of Manley Winkley were identified. At this moment, in Madison Indiana, Manley and Lyman are taking one final trip together. Their mortal remains are traveling from a funeral home to the Indiana Veteran’s Memorial Cemetery. At one o’clock, they will be buried together, side by side, with full military honors. Welcome home, Manley. Rest in peace, Lyman. Thank you for your service. For your sacrifice. Rest in peace and welcome home Pfc. Winkley. God bless you. Rip Private Winkley! Welcome home hero!!! We are a Winkley Family in Maine, and wondered if there might be any relation?